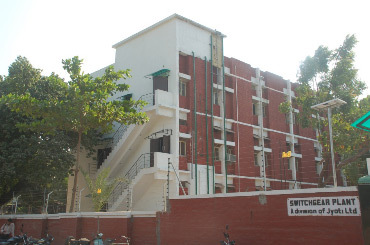 Jyoti has been in forefront of Switchgear technology as manufacturer of Medium and High Voltage Switchgear in India for decades. In 1957, Jyoti pioneered manufacture of 3.3 - 36 kV MOCBs in technical collaboration with Calor Emag, Germany. In 1967, 145 KV MOCBs were introduced first time in India in technical collaboration with Oerlikon Engg. Co., Switzerland. In 1973, first indigenous 33 kV, 750 MVA outdoor MOCB was type-tested at High Power Laboratory, Czekoslovakia. The Indoor MOCB (12 kV, 40 kA / 7.2 kV, 44 kA) was developed and tested at KEMA, the Netherlands and Central Power Research Institute, Bhopal. Jyoti has received Import Substitution Awards from Government of India thrice for development of MOCB range of products. 'Jyoti' 7.2 kV Medium Voltage Switchgear panels and Outdoor VCB's are serving Thermal Power Stations while 12/24/36 kV 'Jyoti' VCB panels & Outdoor VCB's and VC up to 12 KV are in service in utilities and Core Industries. At present, more than 20,000 Nos. VCBs are in satisfactory service. 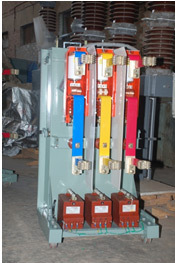 Entire range of Switchgear is fully type tested at independent testing stations in India at CPRI & ERDA. 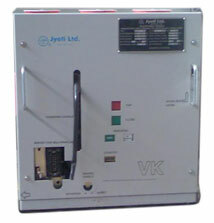 Additionally, Jyoti's 12 kV VCB & Panels are type tested at KEMA, The Netherlands also. The Switchgear Division has received ISO 9001-2008 certificate from TUV CERT, Germany for establishing and applying Quality system.